Matt and I are seven years apart in age. He’s a police officer and I type for a living. We didn’t grow up in the same home, but we’ve always had a brother bond that even if we didn’t see each other for months, we would start where we left off. So for 18+ hours on the road and all the in-between time when we weren’t sleeping (barely), there wasn’t 5 minutes of quiet between us. We talked about everything from children, marriage to politics and career … and of course our hopes and dreams and thoughts about the future. We toasted and drank some excellent Balvenie. We grilled veggies and steaks. And yes, there were plenty of pranks, shenanigans and laughs. After the trip, although we were both exhausted I could not wipe the grin from my face if I wanted to. It’s true. At least in my life. Yes, I have an incredible, supportive wife who is my best friend and amazing children that give me so much meaning and purpose and joy and love. Yes, I have a lot of close friends. But because of the busyness of life — career (running a business) and family (chasing two kiddos around and prioritizing my marriage), I see it’s truth. The key takeaway from the article hit home with me: We, men, need a regularly scheduled activity, especially in mid-life. So it got me thinking about how I’ve tried to find that male bonding time …. and here are my thoughts. Go deeper — the older I get the less I care about small talk. I want to get to the deeper issues of life. My best friendships are the ones where we skip the surface and talk about the iceberg of life — both the struggles and successes. Be more open — my most valued friendships are the ones where I don’t have to wear a mask or a costume. I’m just me, being me. And vice versa. This is all about trust and respect. And no judgment. We all have skeletons in the closet. The most incredible experiences I’ve had is two humans being human together. Recognizing we all have emotions and feelings, hopes and dreams, whether they seem trivial to us or not. I’ve found I’m my worst critic and whenever I’ve been more human and open, I get open and human back. Make lifetime memories — have fun and enjoy each other’s company. The best times are when we’re doing something fun, whether it’s white water rafting in Idaho (or New Mexico) or simply enjoying a drink while telling stories that become our legends. Life is so much about the moments you share. Monthly Mastermind Meeting — although it’s not a mastermind (and we have females in the group), for the last 5+ years, I’ve been meeting with a group of 8-9 Oklahoma City entrepreneurs (via Entrepreneurs Organization) every month for three hours. They’ve been my lifeline of sanity as well as success. It’s been so incredibly impactful on my success and sanity that I’ve also started another forum group in the past, and am in the process of seeding another one this year. I’ve found nothing like it in the world. Like-minded people, in similar stages of life, with the same values and goals, setting aside a block of time each month to work on our icebergs and share our lives with each other. The other one I’ve been a part of like this is one with five other WordPress peeps, but is mainly focused on work/career accountability. Once a Year Retreat — Our Entrepreneurs Organization Forum group also does a retreat once a year for 3-4 days, typically in the summer around June. We’ve done some fun stuff together like fly fishing in Montana to flying jets in Vegas, but it’s always the times around the campfire that mean the most to me. I also look at PressNomics and CaboPress (conferences I try not to miss) as times for bonding with my business friendships. I shouldn’t even label them as ‘business,’ they are friends I’ve made through business. Team Sports — I just recently returned to indoor volleyball, a sport I’ve loved since college, after the urging and push from my wife. In the past, Lindsey and I have also played softball and relished those new friendships and times. Although the team was co-ed, I enjoyed the camaraderie and bonding and looking to playing volleyball again in the summer season. Lema/Miller Slumber Parties — my buddy Chris flew to Dallas to hangout with me for a couple of days and because we’re kids like this, we said it was our Slumber Party. We talked until way too early in the morning and had to force ourselves to go to sleep as it was so much fun. Slumber Party Party Deux is in a couple of weeks. I know, we’re geeks, but proud of it! WordCamps — the Hallway Track is my favorite, especially at WordCamp US. It’s hard to get 5 feet before you’re talking and catching up with some awesome WordPress community friends. 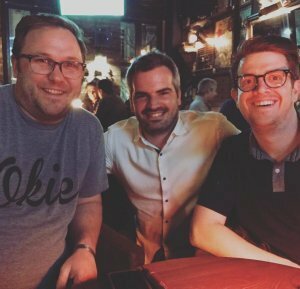 Some of my favorite memories are hanging out (and getting lost on subways) with guys like Michael Torbert way back at WordCamp Boston, or sharing one-on-one time with guys like Karim Marucchi over a good meal. Dad Dates — my buddy Jesse and I have children the same age AND gender. He graciously went with me to see the latest Star Wars movie recently. 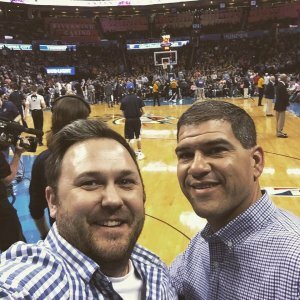 I also had dinner and got to see the OKC Thunder play (courtside, holy cow!) recently with my buddy Jeff. It’s awesome when you are in parallel life stages, and going through similar things. Coffees and Lunches — I enjoy catching up with my buddies and making new ones (like I did recently when John reached out to me as he was traveling to OKC for a wedding). Traveling — on our personal trips, Lindsey and I have a motto and mission: Make friends everywhere. And we have. I love making new friendships with those in new cultures and around the globe. It’s entirely changed the way I do traveling now. My goal isn’t just to see new places, but to meet new people. It’s so mind expanding and special. Our friend Marco and his family, on Father’s Day, took us on a full-day tour of Lisbon, Portugal. So much fun memories — made even more special when his mother gave us tiles that goes on her house (a very cool Portuguese tradition). 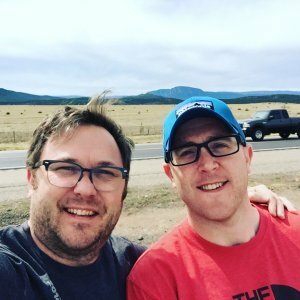 Partner Pals — some of my best memories of my business partners, Scott and Jay, have been on our trips, whether it was to visit the campus of Google and Yahoo or the White House. I want for more trips with these awesome men and role models. Skype, Slack, iMessage chats, Facebook — it’s never a substitute for face to face, or elbow to elbow bonding times. But the article says men aren’t great at talking on the phone (I hate it) yet throughout the year my buddies and I seem to stay in touch via these text chats. My friend Jason is great at keeping up like this. Reunions — after 20 years of not going to my high school reunion, I went a couple years ago and thoroughly enjoyed catching up with old friendships, although I have not kept in touch beyond liking their posts on Facebook. Once a Month In-Person Coffee or Breaking Bread — like every third Wednesday. It’s way easier for me to do lunches or daytime meetings than nighttimes with kids. Once-a-Year Retreats — as I mentioned I already do this with my Forum group … but another in a year would be super nice, like 2-3 days away. Movie Night — whenever a new movie comes out, we go see it on Thursday night — if we can stay up that late! Spousal/significant other support is essential — My wife is my top relationship priority. Without the support of my wife, I wouldn’t do the things I already do, but thankfully she sees the value for my life, health and happiness, and I do for her retreats as well. 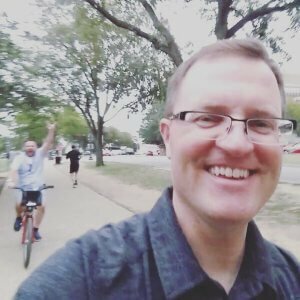 We try to do regular checkins to communicate and see how we’re doing, one of the many reasons I’ve tried to winnow my business travel down drastically this year. Too much time away — I realize with all these ideas, at some point, you can spend WAY too much time away from your family, which ain’t good. It’s all about time budgeting and again talking it through with your spouse and family. It’s interesting to note that Lindsey and I try to do these kinds of spousal retreats and getaways as often as possible. She comes first, always and forever. Getting overscheduled — I try to have as few regularly scheduled meetings in my professional life as I can (let alone personal), and if I were to add too many things above, I’d get way too booked up, which would mean less time for family and family travel. Prioritizing relationships — I realize there’s a limit to how many close relationships one person can build. Proximity is often the prioritizing factor just because it’s easier. Lema talks about how he approaches that here. Gal Pals are just as awesome — over the years I’ve had so many special relationships with some awesome, wickedly smart, incredibly supportive ladies. I’ve found just as much joy with my gal pals and don’t want to leave them out in any way. In fact, looking over my Instagram feed for pics showed me how much time I have spent with these awesome awesome women. OK, what are your ideas?